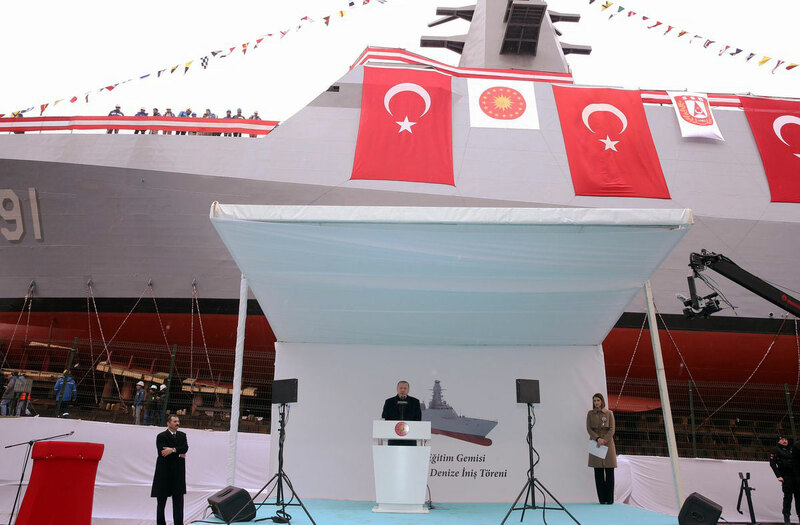 Turkey launched its first indigenous intelligence ship, TCG Ufuk (A-591) on February 9, 2019, during a ceremony held at Istanbul Shipyard. The Turkish President Recep Tayyip Erdoğan and ministers attended the ceremony. The ship has similar design features with the Ada Class corvettes (Turkey's MILGEM national warship programme). The length of the A–591 is 99.5 m with a width of 14.4 m, the same as the Ada class corvettes. The most obvious difference between this ship and the Ada class corvettes is that the TCG Ufuk doesn’t have any weapons. The ship’s top speed is 18+ knots, which is considerably slower than the the ADA class's top speed of 29 knots. The TCG Ufuk boasts a helicopter platform and will serve as a test and training ship for new systems produced in Turkey as well. “The Ufuk corvette will be able to immediately detect threats to our national security, in international waters, for 45 days without pause and in harsh climates and maritime conditions,” said President Erdoğan during a speech he gave at the launch ceremony. "In today’s world, where preventative intelligence, especially signals intelligence, has gained vital importance, the Ufuk will fill a large gap,” Erdoğan stated. He added that Turkey is one of the leading countries in the Mediterranean in both building and maintaining ships.